Your ancestors had paperwork to get on a ship for their overseas journey, they used the same paperwork to get off the ship at their destination. Without the help of Photoshop, scanning devices, and printers available to them, they were unable to change their name en route. So, before your feathers become ruffled by the "but my ancestors" story, know that the Immigration and Naturalization Dept (INS) of the USA, ran by the Federal Government, was no more of a push over then than now. They had rules! See the various processes in this short primer to understand the immigrant process: History of the INS (Note INS now operates under the title United States Citizenship and Immigration Services (USCIS). This is not to say that your ancestor's name was not changed. It's to say it wasn't done at Ellis Island or any other USA port. There are no known documents to support this myth. But known, and verified name changes occurred on both sides of the water. Greek immigrant, John Adasis (father Konstatine Adasis), journeyed to America under the name John Hoboglou. (I know...what???) 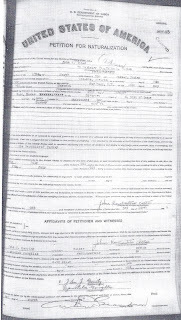 Same person verified by naturalization records, ship manifest, and oath of allegiance as he legally changed his name from John Adasis to John Attas. (see pics above). 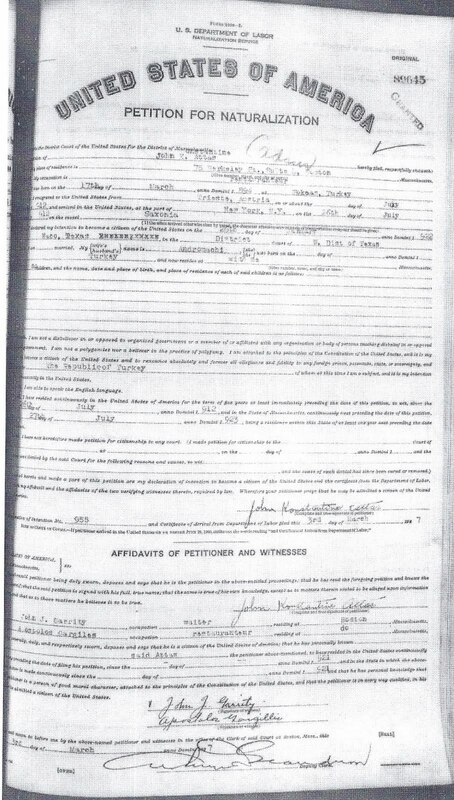 Explanation of the Hoboglou surname was not included in the records, but clearly confirmed this was the name he traveled under and was verified by Ellis Island records accompanied with his naturalization application. Who was Hoboglou? I have no idea! But it was during Greek/Turk wartime, and there was probably a good explanation. Attas was the name the family adopted in the USA. Back Up... African American ancestry does not apply. Although they too were immigrants, when Africans, destined for a life of slavery, were packed or dragged onto a ship they lost their names. When they got off the ship they were given a description as an identifier, a price tag, and buyer's name. No individual name required. No requirement for INS bureaucratic law to get involved in names and spellings. 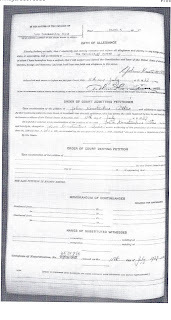 See Ex-Slave Alias on a3Genealogy site for information on slave surnames. FYI: This is different than indentured servants, who often retained their name, but were contracted out at the port to work for their passage. Young children however may not have known their surname as they were often bargained for passage and separated from their family. 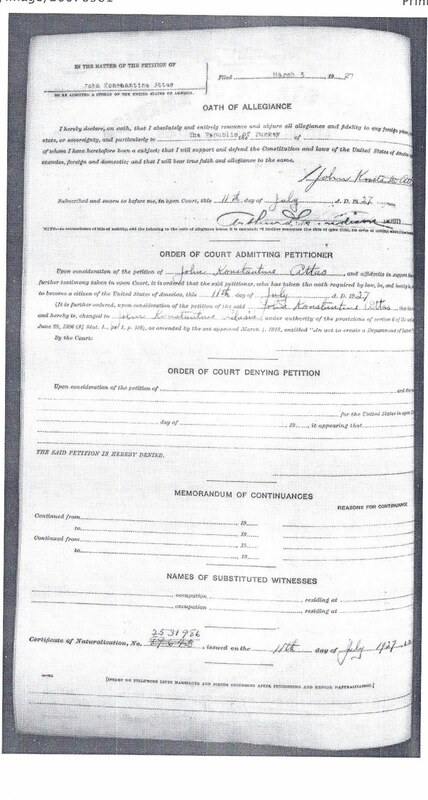 Your ancestor's name was probably changed: in school; prior to their overseas boarding; or perhaps as soon as they hit the streets of Chicago, NY, etc. I've seen plenty official name changes accompany naturalization papers with the Oath of Allegiance, and on Civil War records. I've even seen children (mostly girls) whose name changed while indentured. I've researched families who knew to change their prejudiced name immediately so they could secure work. Brothers and neighbors who came before them had already provided, in pre-travel arrangement letters, suggestions for an acceptable Americanized name. Family folklore tells us differently. "He was illiterate and didn't know how to spell his name," or "The clerk at Ellis Island changed the spelling," etc. But do the records at Ellis Island (or whichever port) support this random spelling change? Take the Michael J. Leclerc suggestion: "try Googling “myth of name changed at Ellis Island." Leclerc's article Research Recommendations: Bursting a Bubble inspired me to write this post. See The Weekly Genealogist; Vol. 14, No. 22; Whole #533; June 1, 2011 dailygenealogist@nehgs.org. -ogly/-oglu/-oglou on the end of the father's name forms the patronymic in Turkish (and related Turkic languages), but I don't know what "Hob" would refer to. Apparently he felt safer traveling under a Turkic-looking name. Thanks for stopping by and commenting. Sometimes when I get queries of "unlikely" I send a blog post to put expectations in line with reality. This is what often inspires me to write a blog. Thanks for this info. You just triggered a few ideas for research. This client is closed, but the name change from his Greek to Turk-like is fascinating. I think I will go back to the ship manifest to get a few more hints.